Many settings in AtoM can be managed directly through the user interface via the Admin > Settings menu (see: Settings for details). However, there are also several configuration files maintained in AtoM’s code where various settings and configurations can be managed, and which can be edited directly by a user via the command-line. These files can be useful for customizing the behavior and performance of your application. Details on each have been included below. You can save changes with CTRL+O + ENTER, and exit with CTRL+X (you will be asked to save if you haven’t yet). If you change any of the files listed below, clear the cache and restart php5-fpm to apply the changes. Global digital object upload limit (in gigabytes) - can be set to -1 for unlimited, or set to a specific limit in GBs. Enable read-only mode, if you want to remove the login button and prevent users from logging into the application. Enable htmlpurifier - limits HTML on static pages to a white-list of approved elements and attributes, to prevent XSS - see: Static pages and security configuration for more information. Symfony (the PHP framework that AtoM uses) has a cascading system of priorization for configuration files - if you create an app.yml file in apps/qubit/config/, its settings will override those found in config/app.yml. This can be useful if you want to change some configuration values without actually altering AtoM’s installation defaults - Artefactual uses this method for automated deployment via Ansible, for example. If your settings changes aren’t taking effect in config/app.yml and you’ve already cleared the cache and restarted php-fpm, you might want to double-check to make sure you don’t have a file in apps/qubit/config/app.yml overriding the other configuration file. If you are using the Vagrant box for example, you will have this extra config file, since Artefactual uses Ansible to automate the build of the Vagrant box. Includes settings for error handling behavior as well - be careful changing these! We don’t recommend it. We don’t recommend changing this file unless you know what you’re doing! This configuration file is used in conjunction with the sitemap generation command-line task - for more information, see: Generate an XML sitemap for search engine optimization. 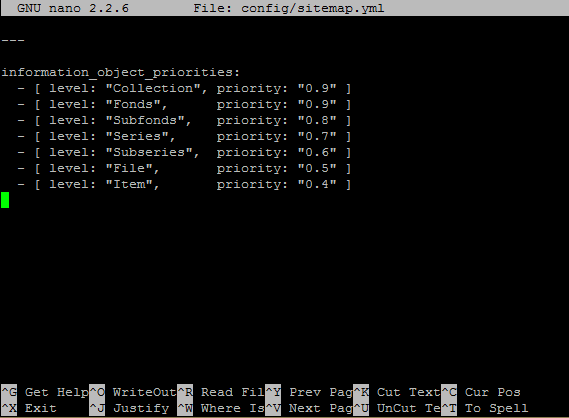 This file contains the priorities (or weighting) for each level of description of archival descriptions included in the sitemap the CLI task will generate. If you have added new levels of description to the Levels of description taxonomy, you can give them a priority here, or adjust the default priorities included in the file (shown in the image below). Remember that nginx is just the HTTP frontend. Internally, each request is forwarded to php5-fpm. php5-fpm is a pool of managed AtoM processes. The pool has its own configuration file that defines some important global PHP settings like timeouts, and environment variables that may also modify the way that AtoM works as documented in accesstomemory.org. The file of the pool is located at /etc/php5/fpm.d/pool.d/atom.conf. Edit with nano. Once saved, run: sudo restart php5-fpm and the changes will apply.